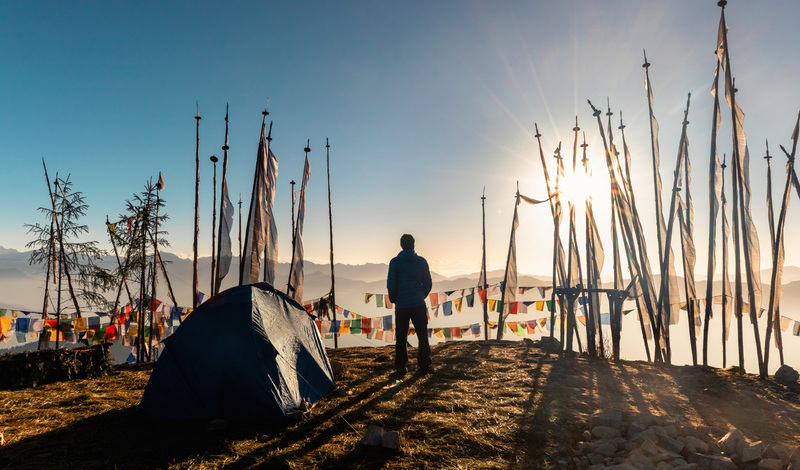 Following the Paro River, the first leg of your journey sees you making your way to base camp at Mount Jhomolhari, Bhutan’s most sacred summit. Along the way pass several isolated villages where you’ll get a glimpse into raw rural Bhutanese life. As you proceed further north, the terrain of the trek will slowly change from the leaves of the forest line to beautiful barren valleys that eventually give way to the snow-capped Mount Jhomolhari. Stop for lunch in the valley with travelling yak herdsmen and listen to their stories and tales, giving you a final burst of inspiration to reach base camp. After a well-deserved overnight rest at base camp, keep moving north towards Laya, stopping overnight at Lingshi, where a diversion up to the Lingshi Dzong is a must. Atop a ridge some 4,220 metres high, you’ll experience something rare in today’s bustling world: absolute silence. Returning back on track, pass through Shomuthan and Robluthans where you’ll camp above rocky meadows overlooking herds of takins and blue sheep which flock to the valley to escape the harsh winter months.